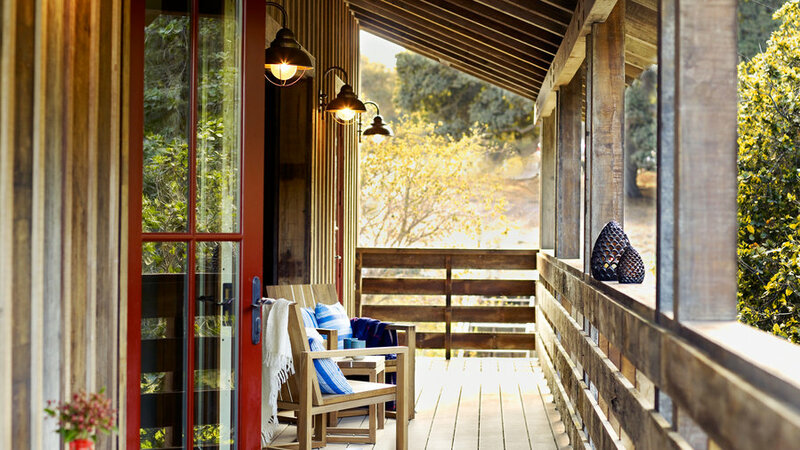 Our Monterey Idea House draws from the richness of its roots in John Steinbeck country. Rustic barn buildings dot the backroads of this storybook farmland community, serving as inspiration for this lavishly textured, architecturally expansive home. 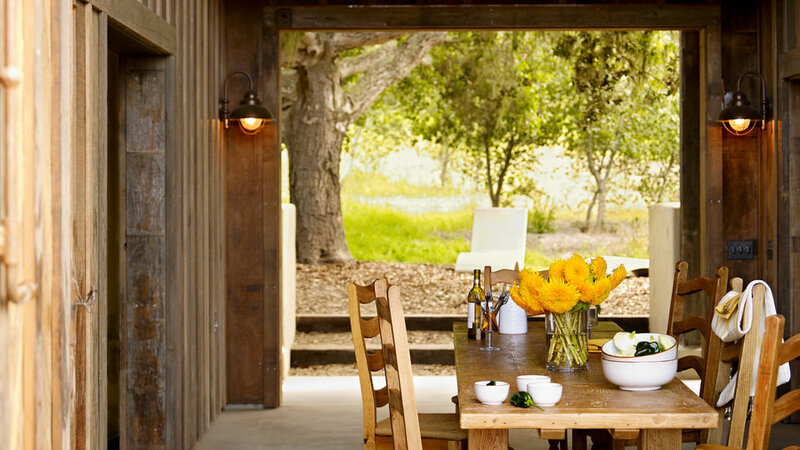 At left, the open-air dining room features reclaimed redwood siding salvaged from an abandoned water tower that once served a local stage coach station. The Idea House comprises three buildings: the guest-suite barn, the main living quarters, and a luxurious bunkhouse for the bedrooms. 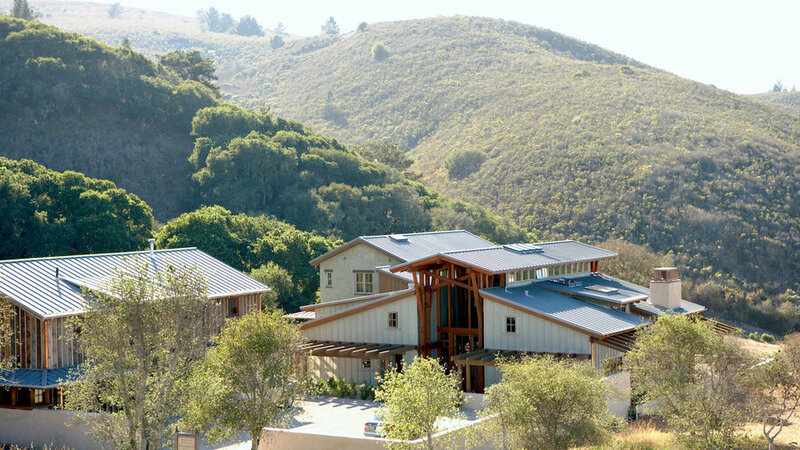 The modern barn aesthetic includes reclaimed redwood siding, James Hardie fiber cement siding, and a standing metal seam roof. Floor-to-ceiling windows, exposed wood beams, and modern pendant lights create a light and airy backdrop for a stunning open sitting and dining room area. The home’s barn motif easily translates into luxurious style throughout the interior. Barn doors from Old World Door frame the entry into the game room. A mahogany pendant from YLighting casts ambient light on the side chair, upholstered in a velour from Sunbrella. 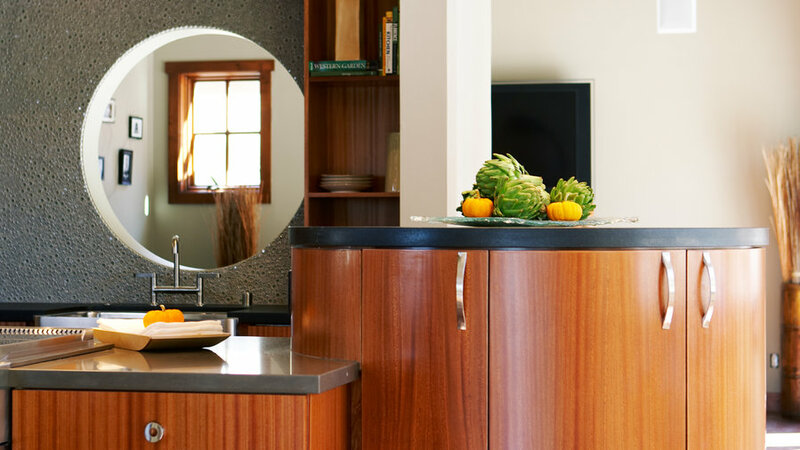 In the kitchen, a circular island functions as both a dramatic focal point and a cabinet for extra storage and prep space. 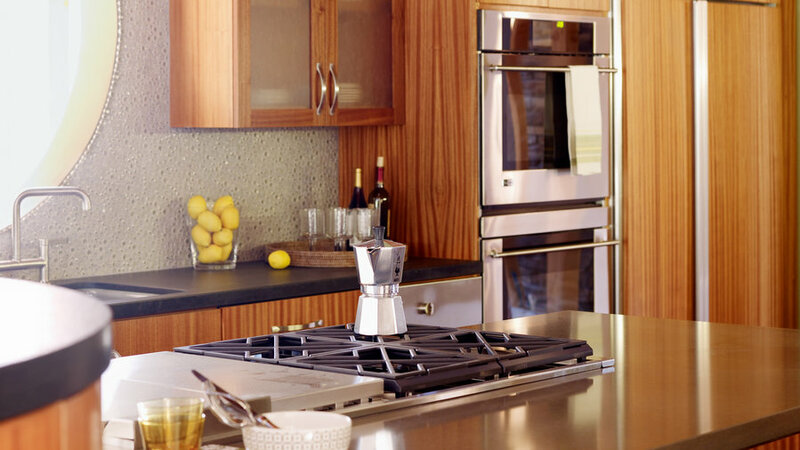 The elegant vertical lines of the cabinetry visually heighten this chef-worthy space, which includes black granite counters, an island with a smooth quartz countertop, and stainless steel GE Monogram appliances. 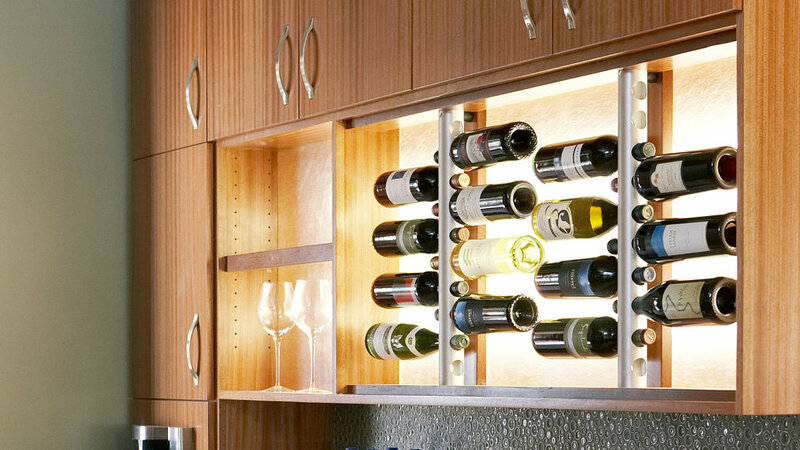 In the kitchen, we combine sapele (an exotic African hardwood) veneers with textured resin inserts and stainless steel. An abundance of coastal light infuses the home's social spaces with a soft glow. Muted colors underscore the tranquil mood. Warm putty-colored walls form a neutral backdrop to the Eldorado Stone massive stone-veneer fireplace, anchored with a chunky concrete mantel. The eclectic mix of furnishings creates a gathering spot; a laser-cut acrylic pendant from YLighting adds diffused illumination. Protected from the elements, the spacious porch provides enough room for entertaining, relaxing, and even sleeping outdoors. Weathered copper lanterns from Sea Gull Lighting and pinecone accent lanterns from Williams-Sonoma Home evoke the wharf buildings along nearby Cannery Row. 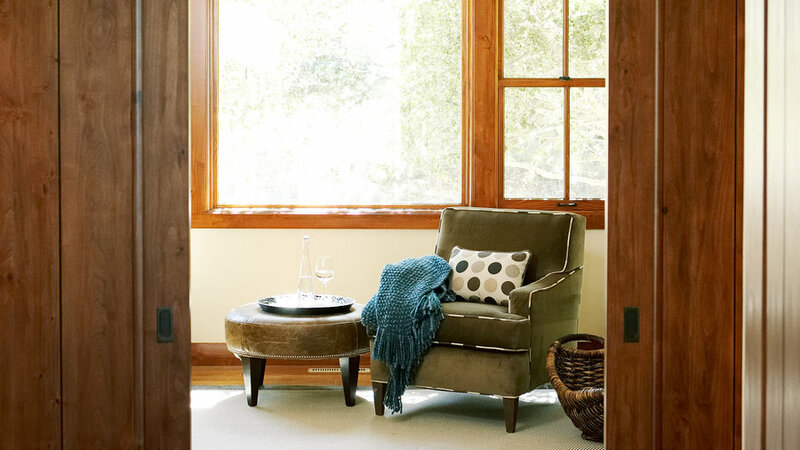 The porch's composite wood flooring adds durability and longevity. The long, smooth planks form a splinter-free surface and balance the rough-hewn look of the barn's reclaimed timber. Mottled browns and grays get a jolt from red French doors by Pella. The rich hue is a nod to the traditional barn color. 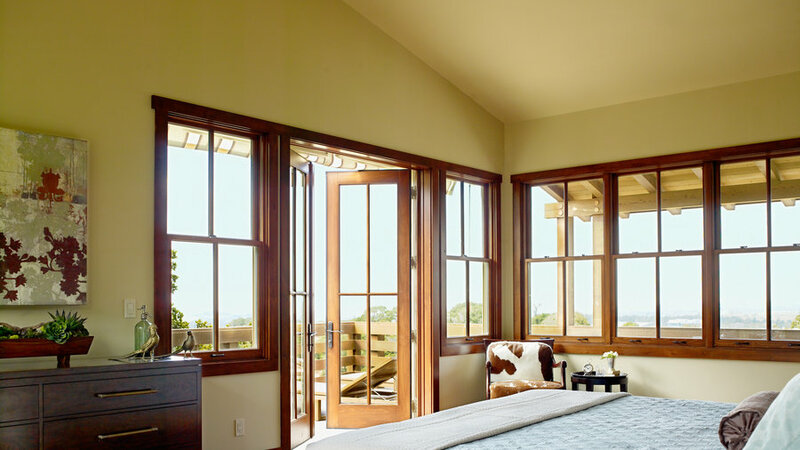 A row of wood-trimmed sash windows forms the perfect frame for an incredible view. A curved wall, covered with gilded, hand-painted parchment paper, forms a glamorous backdrop to the McGuire Furniture Company chaise and side table. The silver satin-ribbon shag rug tickles toes with luxury. Nature is the inspiration for this blend of textures. 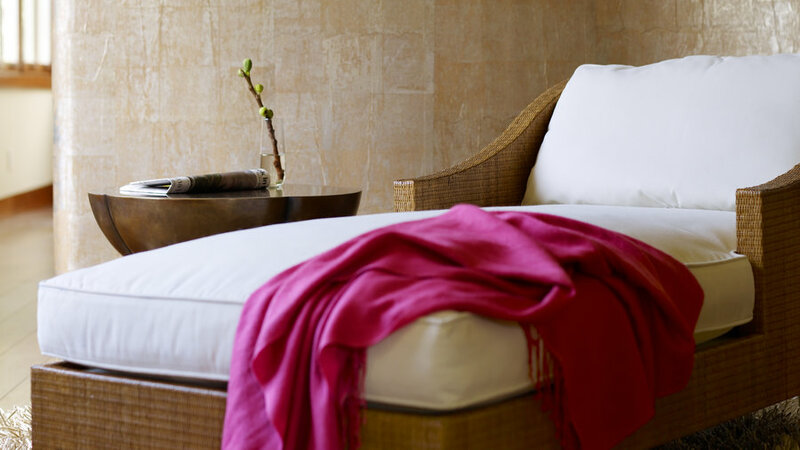 Taking cues from the nearby hills and ocean, this luxe bathing sanctuary is both rugged and refined. Walker Zanger’s blue glass tile forms a “waterfall” from the ceiling down the tub face, ending in a puddle of ModRocks recycled glass pebbles. 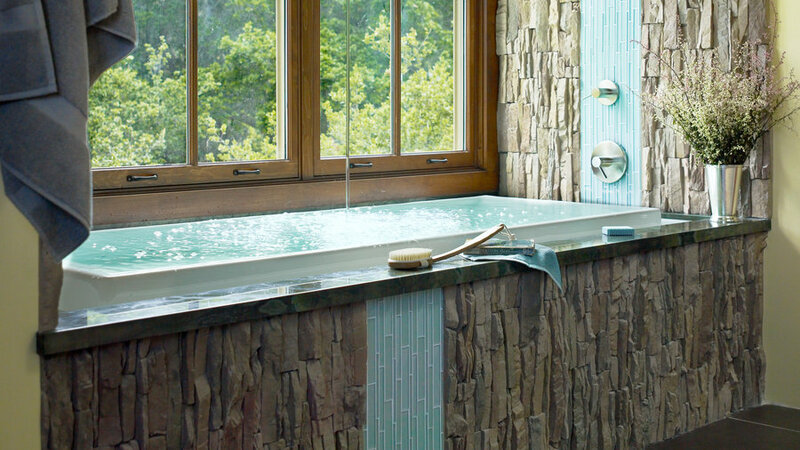 Country Floors’ leatherlike porcelain floor tile anchors the vignette, along with Kohler’s extra-deep whirlpool soaking tub, which is filled from above. Eldorado Stone veneer frames the vanities, running vertically to echo the strong, straight lines of the sapele-veneer cabinetry. 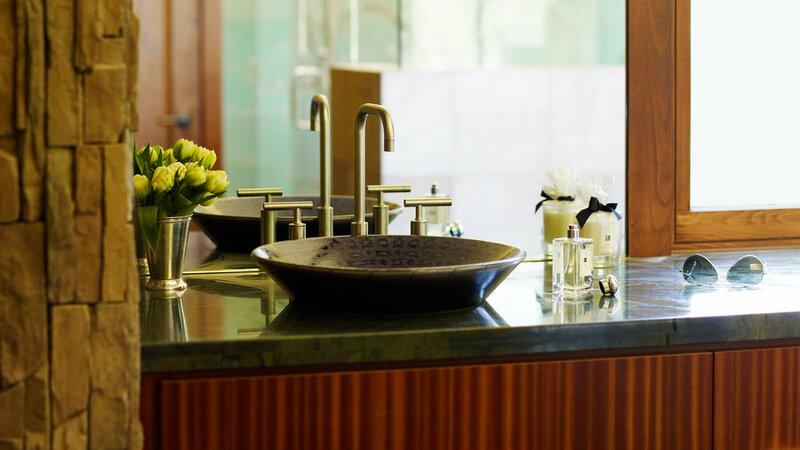 Deep emerald green marble countertops tie the color scheme together. 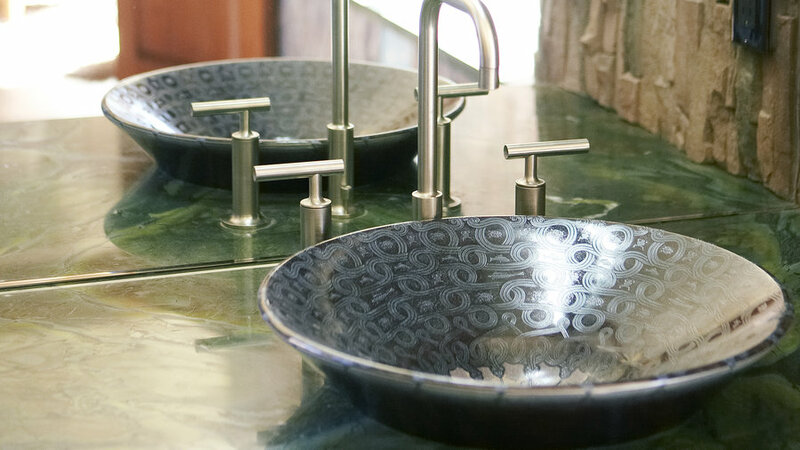 Kohler’s elegant Serpentine Bronze combined with its Purist faucet create a simple but luxurious tableux in the master bath. The granite counter is Aqua Green, providing a solid surface of rich mossy green. 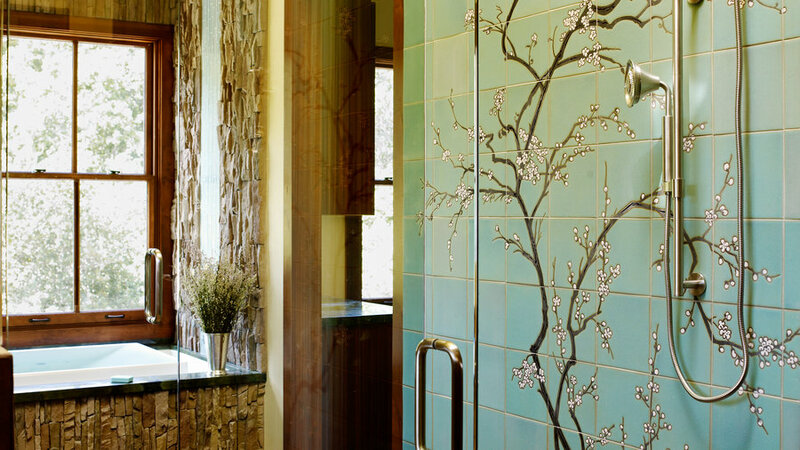 The cherry-blossom mural from Ann Sacks has the vintage look of early California tile. The sandstone tile floor from American Slate showcases the many hues used throughout the bathroom. 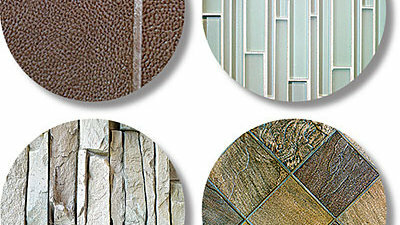 Clockwise, from upper left: ModRocks recycled glass pebbles form a puddle inset into Country Floors’ leatherlike porcelain floor tile. Walker Zanger’s blue glass tile forms a “waterfall” from the ceiling down the tub face. 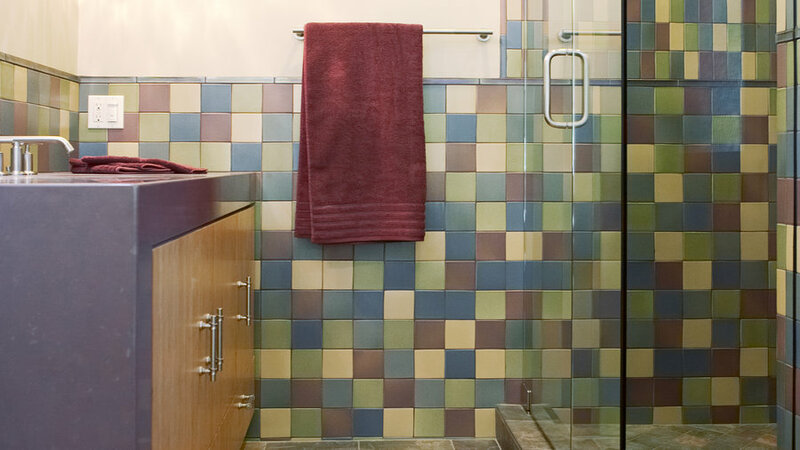 The sandstone tile shower floor from American Slate showcases the many hues used throughout the bathroom. Eldorado Stone veneer faces the walls. 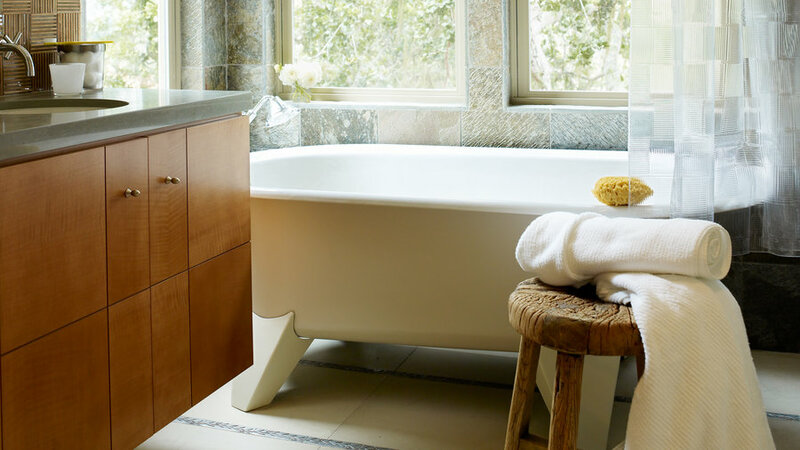 This guest bath combines a fun mix of sleek finishes to create one cohesive look. Composed of recycled glass and concrete, a Vetrazzo counter sits atop the walnut vanity. The vertical glass subway tile draws the eye up at the backsplash. 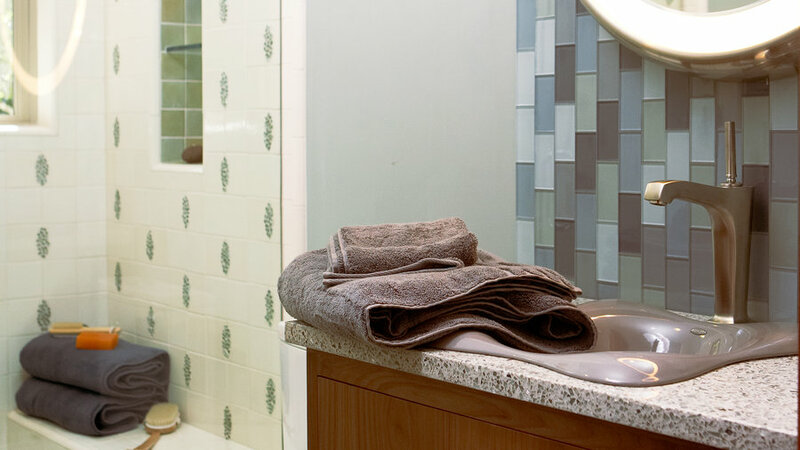 The Jellybean Rocks tile insets in the shower add texture. In the boy's bath, matte checkered tiles from Ann Sacks contrast with the sleek eggplant-colored counter from CaesarStone. Bamboo is used for the cabinetry and forms a rug inset on the floor. 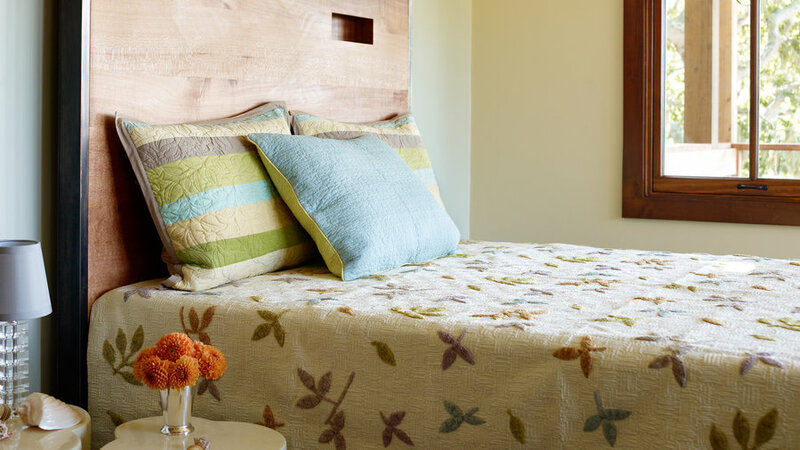 Surrounded by a leafy canopy of green, this home base for a college-age kid is a throwback to treehouse living, show-casing an array of natural textures and materials. Made of Australian lacewood, the custom headboard includes a niche for storing treasures. The cream lacquered side tables are both whimsical and practical, adding extra mobility to the traditional nightstand. An older child's room often serves as extra guest quarters. The leaf-patterned quilt from Tuvalu is casual but polished.